For our tour of Portugal with baby C, we had set up our base in the city of Cascais. 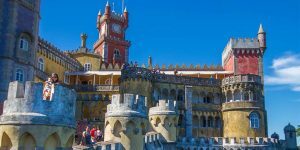 We awoke refreshed having visited the fairytale town of Sintra the day previous. 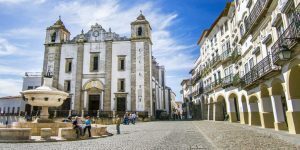 On this day trip, from Lisbon, we go back in time to Fatima, Ourem, and Obidos. 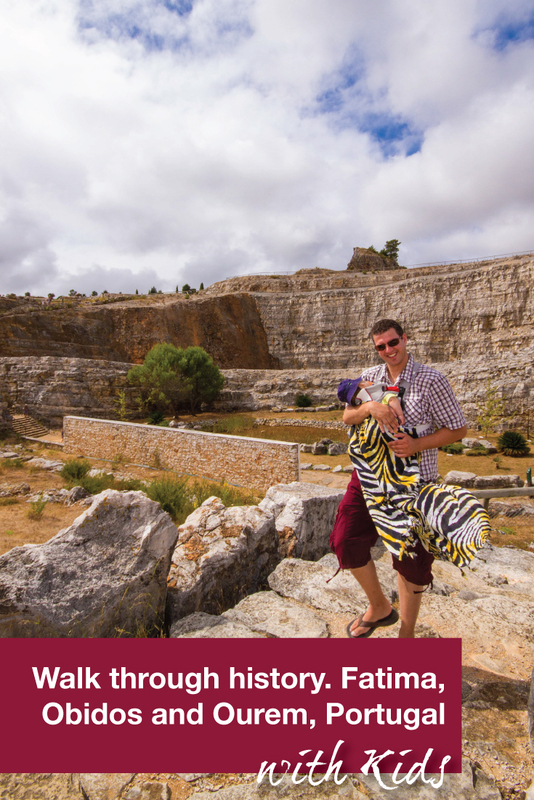 Our adventure would see us visit a site of miracles, a walled city, and castles, and walk amongst dinosaur tracks! You read that right. 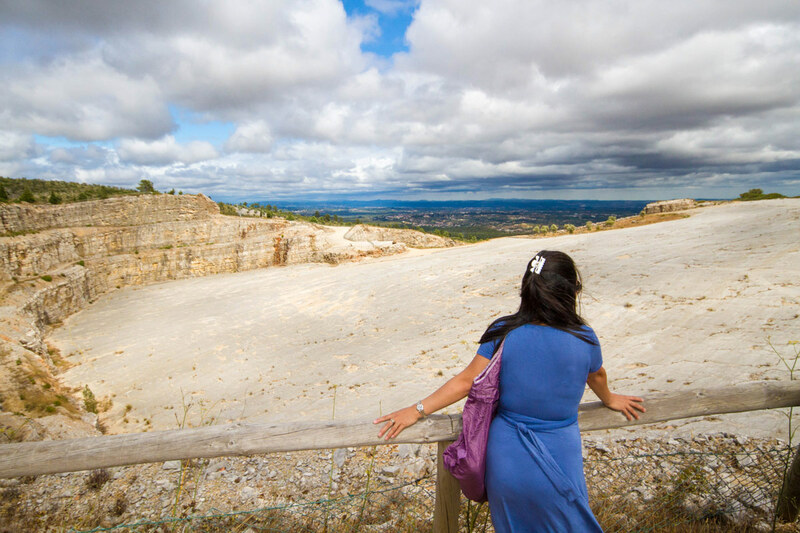 Situated in a quarry, less than an hour from the Sanctuary of Fatima, Portugal lies the footprints of a herd of more that 15 dinosaurs that trudged across the once soft ground 180 million years ago. 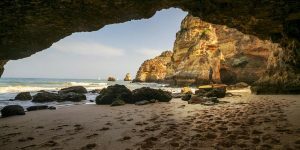 The dinosaur footprints in Portugal track over 140 meters and contain more than 200 individual footprints. 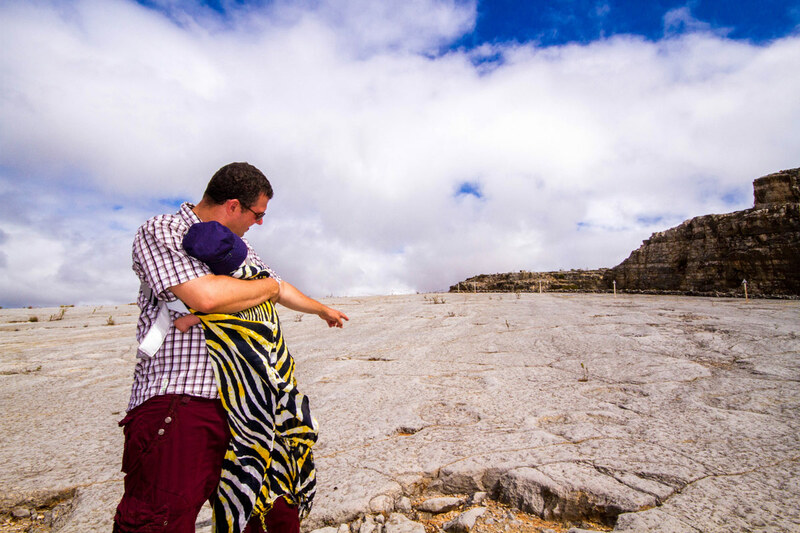 Being so close to the Sanctuary of Fatima and the walled city of Obidos, it was a natural fit to take C to visit these amazing tracks at the Natural Monument of the Dinosaur Footprints of Serra de Aire – Pedreira do Galinha. The Shrine of Our Lady of Fatima is one of the world’s most famous Catholic shrines. It is an easy 1.5-hour drive from Cascais to Fatima on highway A1. The drive from Lisbon to Fatima is slightly quicker on the same highway. Each year around four million people make the pilgrimage to its walls. 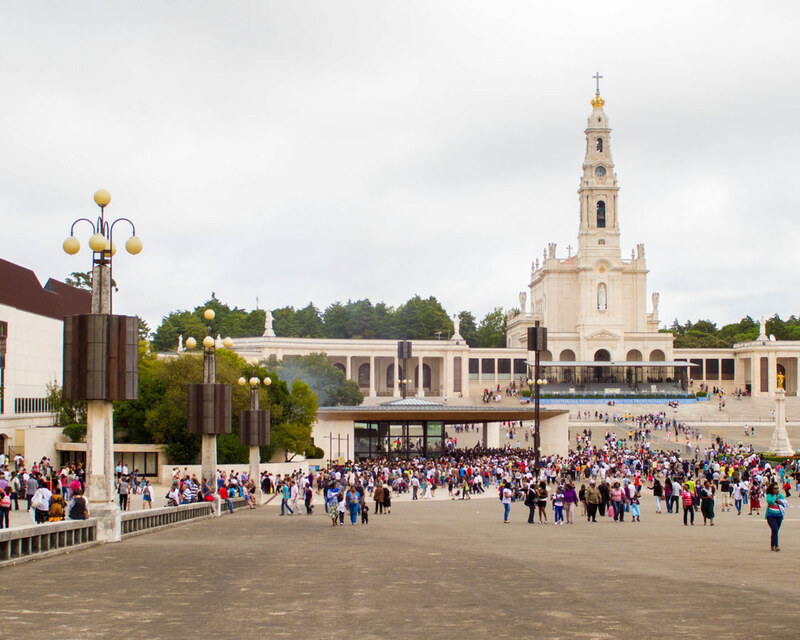 The Sanctuary of Our Lady of Fatima was reportedly the location where three local shepherd children saw apparitions of the Virgin Mary in 1917. Wandering the shrine with C was an amazing experience. 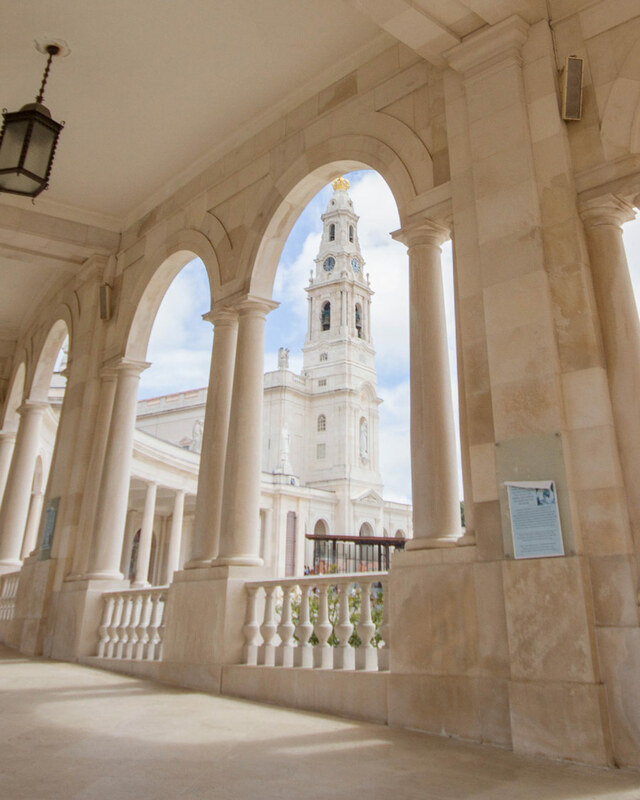 The site consists of the Basilica of Our Lady of Fatima which opens up to an extensive open courtyard. The basilica contains the remains of the Francisco, Jacinta, and Lucy, the three people who witnessed the apparitions. The walk across the courtyard reminded us of the walk towards St. Peter’s Basilica in Rome. The size of the courtyard is a testament to the number of visitors that pay homage to the site. In fact, on the day of our visit, the grounds were packed with thousands of visitors paying homage to the saint. Also on the site is the Chapel of the Apparitions, a chapel built on the site were Mary’s apparitions were thought to have taken place. Lucky for us, the chapel was hosting an international congress of children’s choirs whose voices carried through the huge building and had C breaking out into a huge smile. The beautiful grounds have gardens and statues including Hungarian Stations of the Cross. Having covered walkways was a treat to keep the hot afternoon sun off of our heads. There was a lot to explore in the Sanctuary of Our Lady of Fatima, including the homes and original burial site of the children, but there were also dinosaur footprints to walk amongst! So, we quickly grabbed some lunch at the on-site cafeteria and then off we headed for the short drive to Ourem, Portugal. Although it was less than an hour’s drive from Fatima to Ourem, we arrived with a very sleepy C. Between the heat and the sounds of the beautiful choir at Fatima, he was definitely ready for a nap. He continued to snooze as we carried him through the rolling hills along the Dinosaur Monument (Pedreira do Galinha). The loop through the monument took us up to the top of a cliff overlooking the quarry. The overlook gave us a sweeping look at the clearly visible sauropod tracks under a brilliant blue sky. The tracks were made during the middle Jurassic period, back when Britain, Canada and the Iberian Peninsula were still joined together. 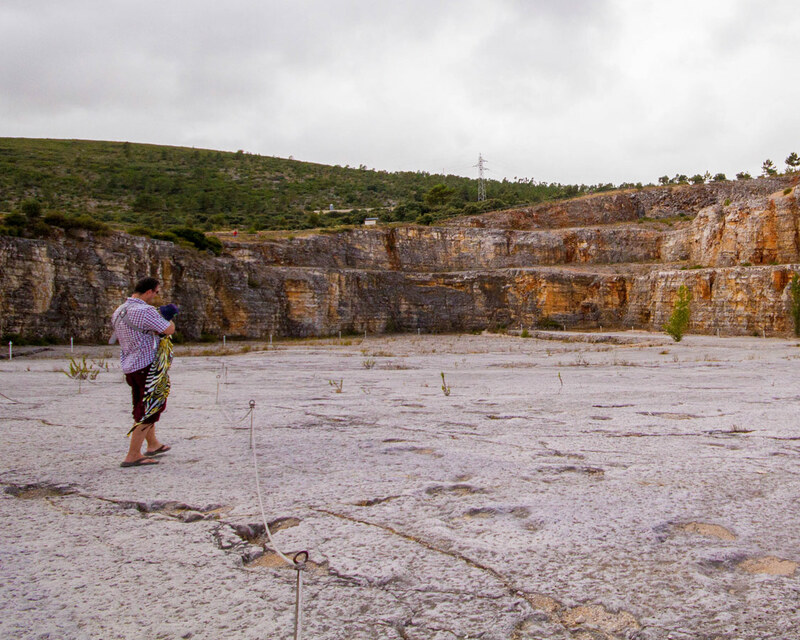 We wound our way down into the quarry and finally got a chance to see these massive footprints up close. These footprints, which were made as the sauropods passed through a shallow wetland, are considered to be the oldest and most well-preserved sauropod prints in the world. Like so many other people out there, the idea of dinosaurs is super cool to me. 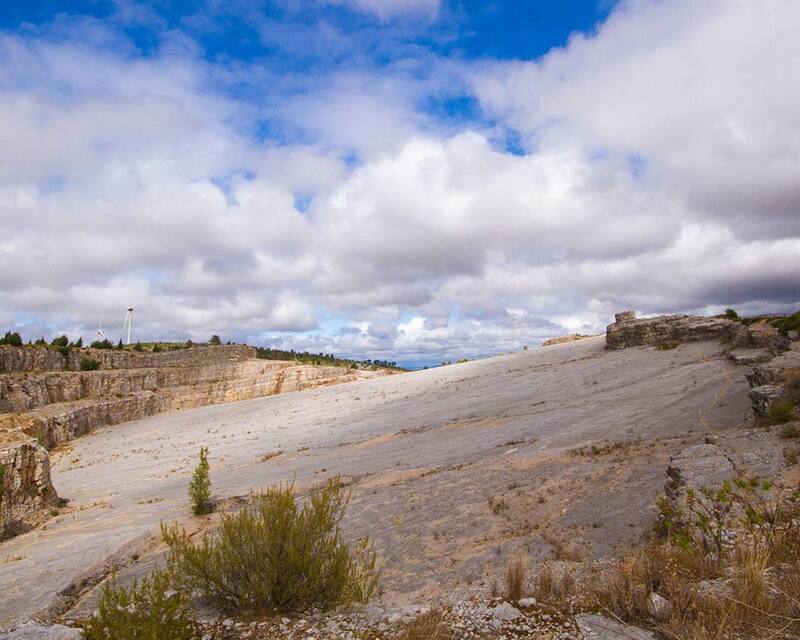 Being able to stand in the footprints of one of these giants, not in a museum or a science center, but under the bright skies in a wide open quarry was indescribable. What made this even more special, was being able to share it with C. When we did this trip, he was only 4-months old, but now at 6, he is as big, if not a bigger dinosaur fanatic than I am. The Natural Monument of the Dinosaur Footprints in Portugal has a small gift shop. It is worth checking out for those visiting. It has fossils that you can purchase, and of course, we got a Mosasaur tooth for C. To this day it’s still his favorite travel souvenir! 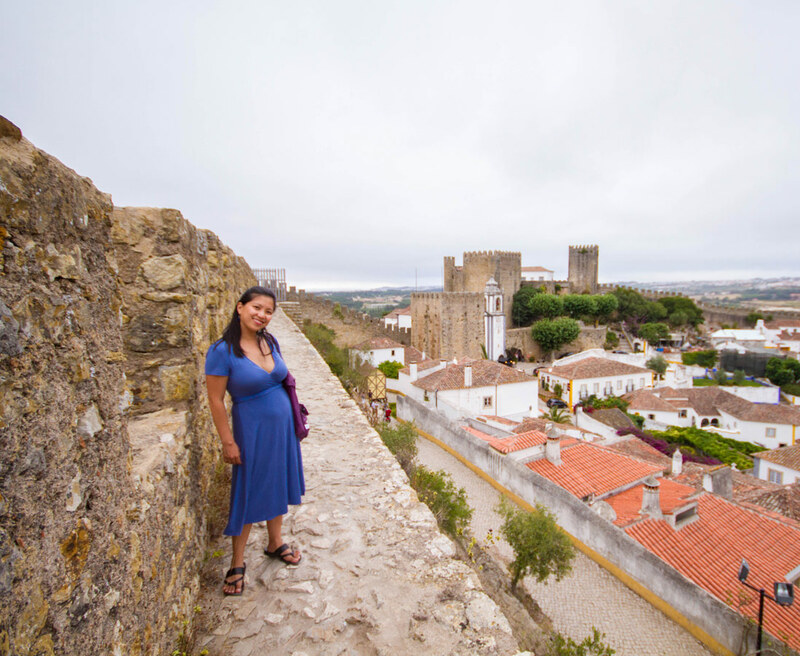 As we headed back to Cascais, we had one more stop, the walled city of Obidos. Built in 1148, the walled city of Obidos was a wedding gift from King Alfonso II to his queen, Urraca, in 1210. This charming town was a pleasure to explore. Although, the cobblestone streets and many stairs meant leaving the stroller in the car. The town itself is small, colorful and easy to get around. The town is surrounded by fortified walls that we walked along and explored. Walking along the walls gave incredible views over the towns tiled rooftops to the towering walls of the castle. While the castle itself has been turned into a hotel, the town as a whole retains an incredibly authentic feel. From the beautiful Santa Maria Church to the pristinely maintained aqueduct that leads into the city, it’s hard to walk through its cobbled streets without feeling like you’ve stepped back in time. Obidos is also famous for a fairly specific cherry liquor called Ginja de Obidos. This tasty shot is a local favorite. 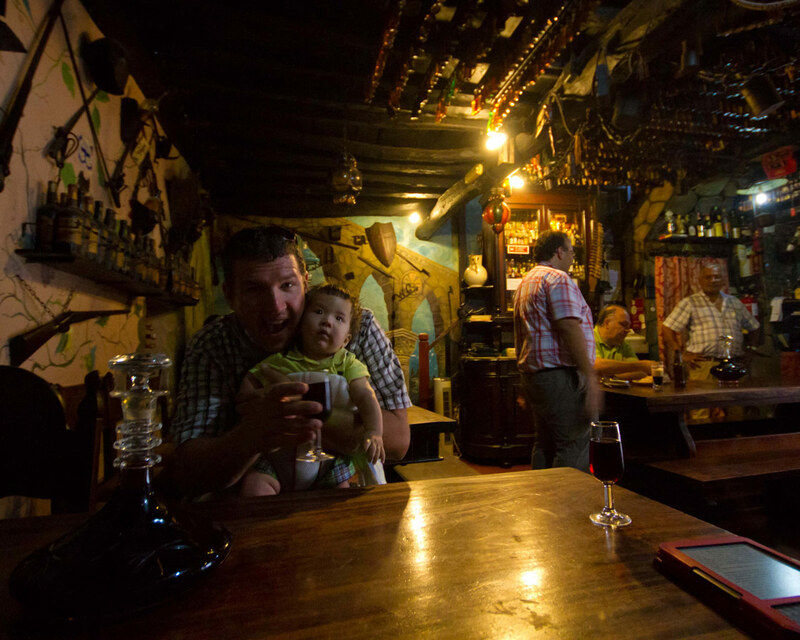 A great place to try it out is the Bar Ibn Errik Rex. With low ceilings and stunning historic interior, it makes for a cool place to take a break but while still exploring. Exhausted after our travels through Fatima, Ourem, and Obidos, it was time for the one hour drive back to Cascais. We needed some rest before our next day exploring the castles of the Knights Templar! Obidos looks beautiful! I didn’t realize they had a dinosaur monument in Portugal, I am so use to hearing about them in Utah and the American West, it’s interesting to hear about them in other parts of the World. Great Post! Oh my gosh, what a great time you had exploring these unusual destinations. How fun to see actual dinosaur footprints, I think that would be really special. The walled city looks like it would be a great place to wander around in. That photo of you and your family is wonderful. 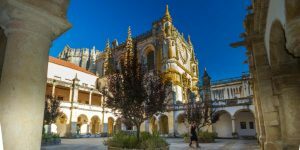 I will be in Porto next week and it looks like Fatima is only a couple of hours away. Might be a nice day trip. Porto is wonderful! Have a fantastic time! Oh, I am so glad you wrote about these places! 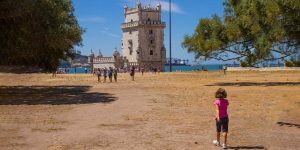 My hubby and I visited Portugal last year, we spent 10 days on the Duoro River, a few days in Lisbon and a day in Sintra and Cascais. We loved our trip and want to go back, so these suggestions are just perfect! So happy to hear you say that! Portugal is such a special place. 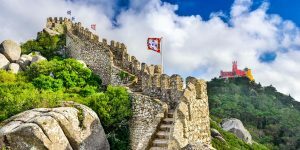 You make me want to go back to Portugal so badly, particularly to Obidos – we stayed in that castle and it was fun to imagine what it would have been like living in that era. The room had a four poster bed and a suit of armor standing nearby. It was very historic and very regal. With your good suggestions, I will definitely take the kids back to see those dinosaur prints – so awesome! Your making us envious! Those rooms sound incredible! Wow you had me at dinosaur footprints! I’m showing my nerd side but that’s so cool & I had no idea it existed so I appreciate you sharing! Even if the gift shop is small I’ll have to buy one of everything! 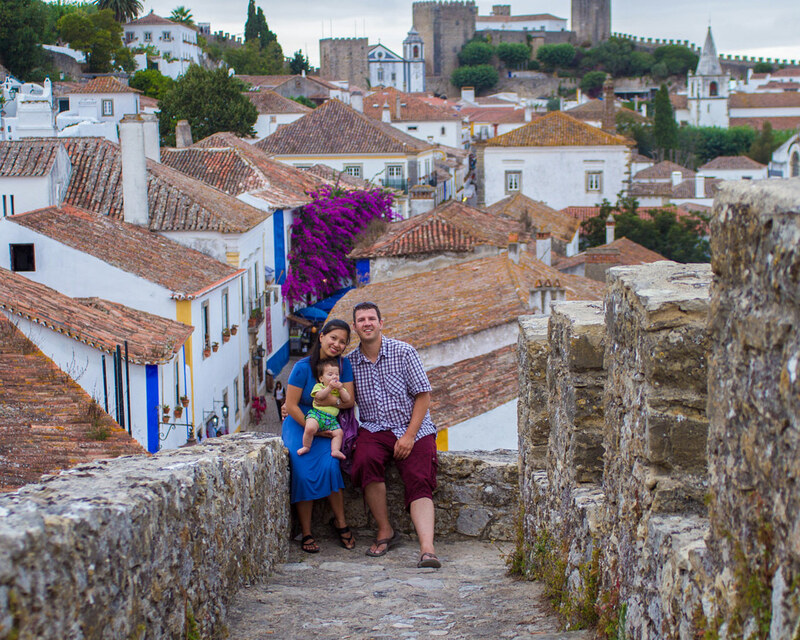 Obidos would be a wonderful place to walk through and explore, and I agree that it looks like you’re stepping back in time. I love the old stone walls, and the rooftops of the homes, and the cobblestone streets. I’m not usually into dinosaur stuff, but actually seeing their footprints fossilized like that sounds really interesting. What a great trip! Thanks for sharing the beautiful photos, too! Portugal is such an amazing country even though it is not very big. I’m jealous that you got to go to Sintra and Fatima because I wasn’t able to when I was there. But I have never heard of this walled city! It looks like an exciting experience that you and your whole family will be able to cherish for a long time. Full marks to you for travelling with your baby. Your little one has had an exciting start to life and II’m sure travel will be part of your child’s destiny! Portugal is amazing. I’ve never been here but it looks beautiful 🙂 Great photos as well.